In The Netherlands they're called a 'hooiwagen', which basically means 'hay wagon'. Very similar to all the other (European) names again! Cheers! Where I come from, the Crane Fly is also called "daddy-long-legs" and it is not a spider either! Wow, never heard of a crane fly, but that is what we would call a may fly. 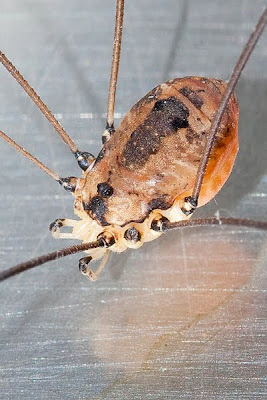 Harvestman body looks like it might glow a bit. How interesting. In North Carolina we call them Grand Daddy Long Legs. That lump on the top of the body is a 'turret' where the eyes are situated.